Product #18727 | SKU LP36399-PWW | 0.0 (no ratings yet) Thanks for your rating! The black Pro Roller Lite 250AW from Lowepro is a travellers bag and slightly larger than the Pro Roller Elite 150 AW version. Made for the inveterate, constantly on-the-go, mover and shooter, this case is made with durability and functionality in mind. It's a lean and mean case that holds a world of gear such as 2 pro DSLRs, one with attached lens such as a 14-24mm, 24-70, f/2.8 or 70-200 f/2.8; 4-5 extra lenses; 2 flashes; spare batteries and memory cards and up to a 15" laptop or tablet plus extra accessories or personal items. With its rolling format, navigating through parking lots and airports won't be a problem. And, if the wheels become damaged, they are readily replaceable. Lowepro's ProTech Trolley System features an angled telescoping handle to provide more depth inside the main compartment. Inside, it's fully padded with movable dividers to configure the case to your gear needs. A separate laptop compartment protects it and keeps it away from your other gear so it will never get scratched or abused. Out front, there's another storage pocket for quick grab items like tickets, documents, maps and folders. And, if the weather turns sour, you can always deploy the included Lowepro All Weather cover that will protect the bag from the elements. Accessing the bag is easy via the rugged YKK zippers that will accept a user-supplied lock. This is a relatively lightweight bag weighing in at 9.5 lb (4.3 kg) and is backed by Lowerpro's lifetime warranty. 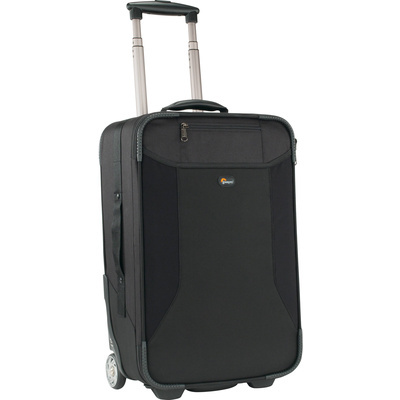 FAA and airline carry-on specifications are subject to change without notice, please cheque with your airline before designating this case as a carry-on item. Most airlines require carry-on items to have an external linear measurement that is equal to or less than 114.3 cm. The external dimensions of this case add up to 114 cm.